While our world is filled with its own natural sounds that we can’t resist to enjoy, it is also chock-full of other sounds that can be irritating. Some people have difficulties finding the peace and quiet they need to sleep, work or study, which is exactly where a good noise cancellation machine comes in. I’ve tried using ambient sound apps for the same purpose, but they just don’t work as well as noise cancelling machines when it comes to sleeping. And, I’m not a fan of sleeping in earplugs all the time, which is why I love this type of gadget for sleeping. These machines are also perfect for meditating. If you are looking for an ideal solution that will enable you to block the irritating sounds out so you can focus on what’s really important (like sleep, meditation or getting work done), you should take a look at the following proven best noise cancelling machines for the money based on my comparisons of the top sound therapy machine models below. The Marpac Dohm-DS Dual Speed Sound Conditioner has always been and will probably be the most popular noise cancellation machine for light sleepers for many years to come. It made its debut in 1962 and ever since it has certainly passed or exceeded the customer satisfaction test. A quick look at any message board will show you that this design is well-liked and personally, I love it. So, who is it for? 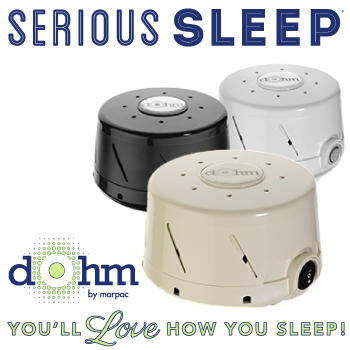 Like mentioned above, the Marpac Dohm-DS Speed Sound Conditioner is ideal for light sleepers, as it generates white noise that is louder, more soothing and purer than many other devices on the market. If you are in search for an effective and simple white noise generator, then this model is a perfect choice for you. • If you always get confused or frustrated by technological devices that come with numerous buttons and controls, you will be relieved to find out that this model is extremely easy to use With the flip of a switch, you can choose either the “high” or “low” setting, and by twisting the cap and collar, you can fine-tune the sound to your preferred volume and tone. • This model is also customizable. • This model is made of sturdy plastic, which makes it durable. • Lightweight and compact — This model has a base diameter of 5-3/4 inches and it is only 3-1/4 inches high. It is just 1-1/2 pounds, which makes it highly portable. • Unlike various other white noise machines, the Marpac Dohm-DS Speed Conditioner doesn’t come with extra features such as timers, alarms and an assortment of nature sounds. If your concern isn’t getting up early, then you don’t have to worry about those extra features. Furthermore, you may already have other devices that already have such features i.e. a phone or an alarm clock. 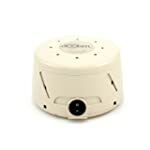 • This model doesn’t block out very loud noises, but when you come to think of it, there is no white noise machine out there that is capable of dulling loud noises completely. This can only mean that incorporating ear plugs is something that you should also consider for total silence. This model comes with 6 different digitally recorded natural sounds, i.e. rain, ocean, brook, summer night, white noise and thunder. The natural sounds help you a great deal to sleep, study, work or read. This noise cancellation machine is ideal for those who find it hard to sleep in total quietness. It is also perfect for those hoping to mute or lessen loud noises. • It is very easy to use as all you need to do is to just press the button with the natural sound you want to hear and voila! • It comes with an auto-off timer that enables users to run the machine for fifteen, thirty or sixty minute at a time. • It is lightweight and compact, which makes it just right for travel. • It is a reasonably priced noise cancellation machine. • The sound loop of the model is about 5 seconds, which makes it a bit unfavorable to those who like longer tracks. • Doesn’t come with an Ear Phone Jack, thus doesn’t provide the option of listening to the natural sounds privately. The good thing is that the sounds produced can merely cause disturbance to others. 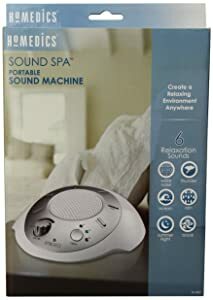 Overall, the HoMedics SS-2000/F-AMZ Sound Spa Relaxation Machine is really a great and highly recommended product. For such a favorable price, users can get a good night sleep and wake up every morning feeling relaxed and well rested. This is a noise cancellation machine that features upward-facing speakers for full-room, high definition sounds. This model automatically adjusts to lessen the effect of background noises, delivering a rich audio experience that is unrivaled. It offers a total of 10 distinct natural sound profiles that promote deeper sleep and relaxation. Unlike other white noise sound machines, this model energetically combines extensive, naturally recorded, high-definition sounds eradicating repetition. 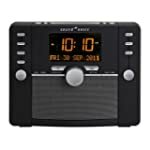 • It’s the only white noise machine available that has adaptive sound technology, which adjusts the volume to mask intrusive noise and responds to those noises by remixing sound profiles without becoming disruptive itself. 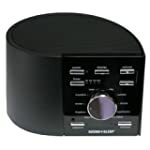 • It comes with a 4-level sleep timer for gradual turn-off in thirty, sixty, ninety or a hundred and twenty minute increments, or all night operations. • It comes with a 1-year labor and parts warranty, and a thirty-day return privilege. • It has a sleek, compact design that fits perfectly on a table, chair or bedside. • At 2.6 pounds, it’s not as lightweight as various other white noise machines out there. However, it’s still portable despite it being a bit heavy than other models. 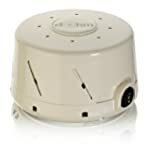 • It is a bit pricey compared to other white noise machines. 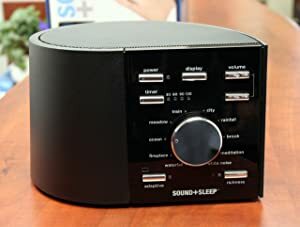 At about $111 at Wayfair, this is one of the highly priced noise cancellation machines on the market. However, the machine is worth every single cent considering that it provides many added benefits and features compared to other models. Despite the Ecotones Sound + Sleep Machine being a bit pricey than other noise cancellation machines, its remarkable features still makes its pricing very reasonable. If the price isn’t a major factor to you when buying, then you will find this model quite valuable and reliable. I would like to check which machines can block out noise from the Engine Room generated by generator?